Events and meetings are central to an association's life. Our calendar is highly configurable and capable of keeping your members and officers informed of all upcoming events to attend. Easy-to-use Editor - allows you to easily enter events for a single date, range of date, or multiple dates. Public Submission/Member Submission - options allow the general public to submit events or general members to submit events from the Member Menu; the events would then be placed in pending status for an editor to review and approve. Event Types (Categories) - organize your events into types and sub-types and then display multiple calendars filtered by these types. Great for separating board and administrative meetings from public-events. Multiple Calendar Formats - offers a variety of calendar formats with different sizes and features. 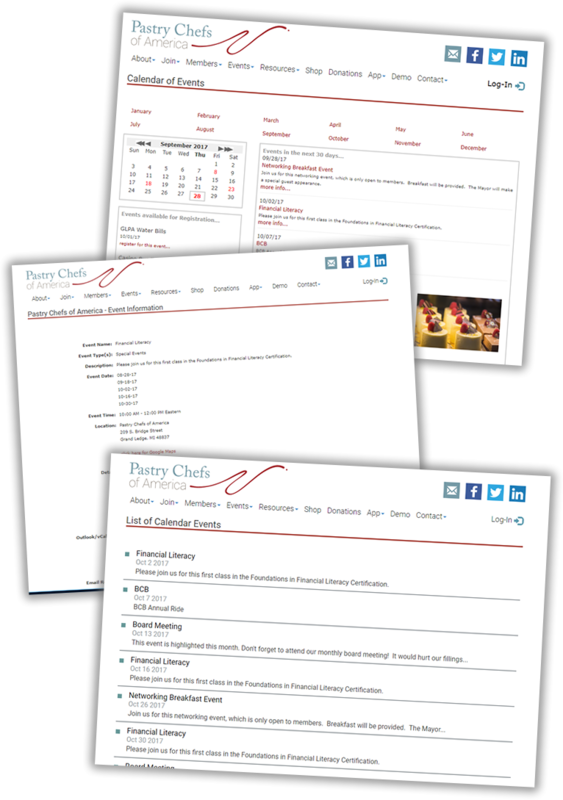 Custom Calendar Format - depending on your needs, we can assemble a calendar for your site that suits the nature of your events and association. Map to Location - make it easy for attendees to find your event by posting a map to the location address. Open Events - allow for events to be 'open', such tha non members may 'invite themselves' to the event. Email Reminders - visitors to your website can request an automatic 'email reminder', to be sent to them in the future to remind them of the event.